Los Angeles, CA – January 7, 2015 – Thought Development Corp., developer of the leading workflow management system for the media promotions industry, announced that FOX Sports has chosen ON-AIR Pro™ to help improve the company’s workflow processes and standardize end-to-end production across its brands. FOX Sports, which includes the sports television arm of the FOX Broadcasting Company, will use the system to unify production teams across the company’s Los Angeles and North Carolina facilities. The installation of ON-AIR Pro™ will include a robust suite of tools and modules to support and improve the company’s existing on-air process workflow. In addition, the system will be able to integrate with existing program scheduling and media systems. “We are excited to be working with such engaging teams to address the fast paced needs of sports while streamlining and facilitating their creative processes – from concept to air,” commented Jonathan Mickelson – Chief Technical Officer, Thought Development Corp.
FOX Sports is the umbrella entity representing 21st Century FOX’s wide array of multi-platform US-based sports assets. Built with brands capable of reaching more than 100 million viewers in a single weekend, FOX Sports includes ownership and interests in linear television networks, digital and mobile programming, broadband platforms, multiple web sites, joint-venture businesses and several licensing partnerships. FOX Sports includes the sports television arm of the FOX Broadcasting Company; FOX Sports 1, FOX Sports 2; FOX Sports Regional Networks, their affiliated regional web sites and national programming; FOX Soccer Plus; FOX Deportes and FOX College Sports. In addition, FOX Sports also encompasses FOX Sports Digital, which includes FOXSports.com, FOX Sports GO, Whatifsports.com and Yardbarker.com. Also included in the Group are FOX’s interests in joint-venture businesses Big Ten Network ans BTN 2Go as well as a licensing agreement establishing the FOX Sports Radio Network. With over 15 years experience in streamlining Broadcast, Cable, Film, and Gaming Marketing, Thought Development is the premier developer of workflow systems for the media promotions industry. 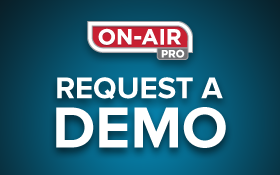 The company’s flagship product, ON-AIR Pro™ is designed to flexibly manage the complete on-air promotion process, as well as the changing requirements of off-air and digital promotion. It is the leading creative workflow tracking system developed exclusively for entertainment marketing. For additional information about Thought Development or the ON-AIR Pro™ system, or to schedule a demonstration call (+1) 818.781.7887 or visit our website http://www.thought-dev.com.